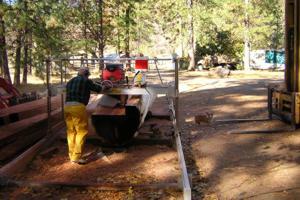 Add ons: Extra rails to saw up to 40 foot logs, weatherboard attachment. 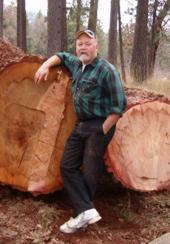 Operation: Bought the mill to build a timber frame house on his 138 acre tree farm, but his forestry consulting business has kept him too busy. Has been doing some custom sawing with a friend that has a bandmill but doesn’t have the capability to handle the big logs that he can on the Peterson. 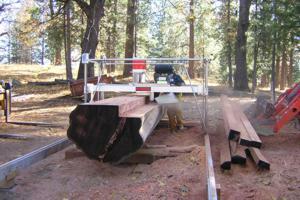 He’s used the mill on black walnut slabs, redwood posts and beams, and is currently working on a log bridge for a logging project. Also on the horizon is 15,000 board foot of red fir for 12×12 beams and posts that will be used for a custom home at a ski resort in Sierra. Best feature: The capability to saw 20 inch wide stock easily. Folks I know with other mills envy my ability to do this without rotating the power head. Tip: Add on a water valve to eliminate the five gallon water jug. A retired sharpener commented that he was impressed with the Peterson’s ability to keep the blade cool with lots of water. Motto: Take advantage of the power of that hydraulics and heavy equipment have to move big logs.